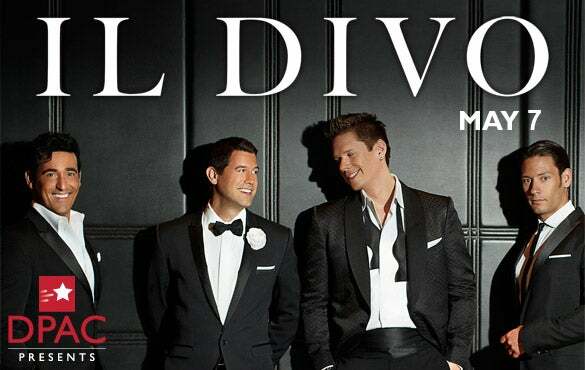 JANUARY 25, 2013 (Durham, NC) — IL DIVO, the world's foremost classical crossover quartet, today announce bringing their new BEST OF IL DIVO tour to DPAC, Durham Performing Arts Center, for their first ever show in the Triangle on May 7, 2013. This new show will see Il Divo perform with a full orchestra, their signature classical interpretations of popular songs across their whole career catalogue. Friends of DPAC members may place their orders on January 31. Joining Friends of DPAC is free, and you can register at www.DPACnc.com/friendofdpac. Exclusive VIP Meet & Greet Ticket packages will be available for each show at www.ildivo.com. "When DPAC was being built I'd think about superstars like IL DIVO and other large acts that used to routinely bypass the Triangle. They are national and international superstars, but until DPAC opened there was never a large concert theatre that could accommodate a major tour like this. It's these one-of-a-kind, big events that we love best at DPAC," said Bob Klaus, GM of DPAC. The world’s first and still the best classical crossover group – Urs Buhler, Carlos Marin, David Miller and Sebastien Izambard – have sold over 26 million albums, enjoyed over 50 number ones, chalked up 160 gold and platinum sales in over 33 countries. Proving the lack of geographical boundaries to their romantic and timeless repertoire, Il Divo have become a global touring phenomenon. Their 2012 fourth world tour saw them perform an incredible 134 shows across 46 countries on 6 continents. Their amazing career knows no bounds. Highlights include appearing at the opening and closing ceremony of the 2006 Fifa World Cup, touring as special guests to Barbra Streisand, a 2009 performance at President Obama’s Purple Inauguration Ball and recently at a special concert for Her Majesty Queen Elizabeth’s Diamond Jubilee at Windsor Castle. Many of the tracks for the new Best of Il Divo show have been chosen by their fans all over the world and will include favorites ‘Somewhere’, ‘Unbreak My Heart’, ‘Unchained Melody’ and ‘Adagio’ as well as several new songs such as ‘My Heart Will Go On’ (in Italian), ‘I Will Always Love You’ (in Spanish) and ‘I Can’t Help Falling In Love With You’ (English) from their recent global Greatest Hits album release. With a mission of presenting one-of-a-kind live entertainment events, DPAC truly has “something for everyone,” hosting over 200 performances a year including spectacular touring Broadway productions, high-profile concert and comedy events, family shows and the heralded American Dance Festival. Operated under the direction of Nederlander and Professional Facilities Management (PFM), DPAC has twice been listed as the #1 performing arts organization in the region by the Triangle Business Journal. What’s up next at DPAC? Superstar comedienne and Emmy©-winning talk show host Whoopi Goldberg (Jan 25) followed by a night to remember with music’s best Tony Bennett (Feb 1).